The perfect beach condo with ground floor convenience. The open floor plan is perfect for entertaining or intimate family time with French door access to your lanai. Spacious with three full bedrooms, it comes partially furnished as viewed and is great for casual living, second home or beach rental. Unbelievable location within walking distance to everything St. Augustine Beach has to offer - the beach, Pier, restaurants, and shops. It's time to live the beach life and just relax.The bedrooms are all good sized and you will love the spacious walk-in closet in the master bedroom. Master bath has dual vanity and a large soaking tub and separate shower. The kitchen has lots of cabinets and counter space, and is open to the dining and living areas. The large utility room holds your laundry and systems out of sight. The complex was built in early 2000's with strong, solid concrete walls. You can enjoy the clubhouse, fitness, or lounge by the heated pool. The community lake provides a beautiful backdrop for the center courtyard that is viewed from the lanai. 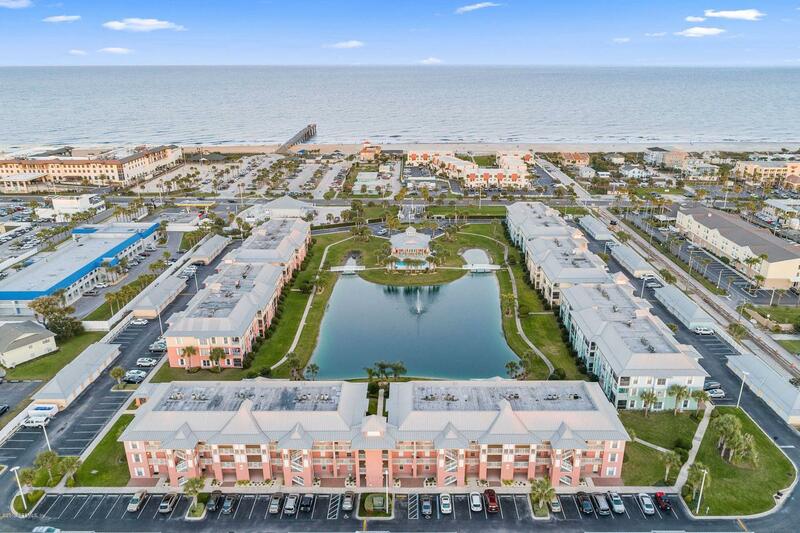 This is Florida living with time filled with walks on the beach and just a few steps few steps from your favorite restaurants. Just a short drive to Historic Downtown St. Augustine or other attractions. You will love it here!